Earlier this month I used the example of “cargo cult science” to explain confounding bias. But cargo cult science can teach us about something even more fundamental, scientific integrity. Natural childbirth advocacy is a “cargo cult” because it fails to address the problem of confounding. More importantly, though, natural childbirth advocacy, like cargo cult science, lacks scientific integrity. To understand what I mean, it helps to go back to the original exposition of the term “cargo cult science.” Physicist Richard Feynman coined the expression in his 1974 commencement address at CalTech. 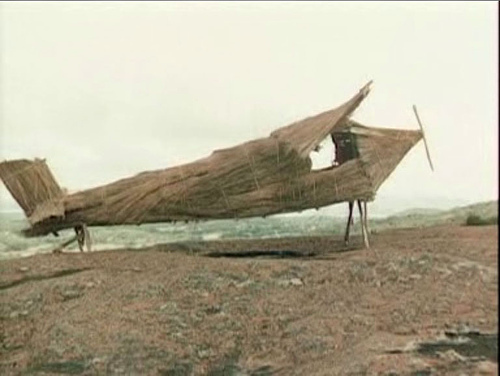 … In the South Seas there is a cargo cult of people. During the war they saw airplanes land with lots of good materials, and they want the same thing to happen now. So they’ve arranged to imitate things like runways, to put fires along the sides of the runways, to make a wooden hut for a man to sit in, with two wooden pieces on his head like headphones and bars of bamboo sticking out like antennas –he’s the controller– and they wait for the airplanes to land… So I call these things cargo cult science, because they follow all the apparent precepts and forms of scientific investigation, but they’re missing something essential, because the planes don’t land. … It’s a kind of scientific integrity, a principle of scientific thought that corresponds to a kind of utter honesty … For example, if you’re doing an experiment, you should report everything that you think might make it invalid–not only what you think is right about it: other causes that could possibly explain your results; and things you thought of that you’ve eliminated by some other experiment, and how they worked — to make sure the other fellow can tell they have been eliminated. …If you make a theory, for example, and advertise it, or put it out, then you must also put down all the facts that disagree with it, as well as those that agree with it… [T]he idea is to try to give all of the information to help others to judge the value of your contribution; not just the information that leads to judgment in one particular direction or another. This is something that natural childbirth advocates almost never do. … Last night I heard that Wesson oil doesn’t soak through food. Well, that’s true. It’s not dishonest; but the thing I’m talking about is not just a matter of not being dishonest, it’s a matter of scientific integrity, which is another level. The fact that should be added to that advertising statement is that no oils soak through food, if operated at a certain temperature. If operated at another temperature, they all will — including Wesson oil. This is a critical point. The empirical claim is true, but the implication is false and those making the claim are aware of it. 1. The US infant mortality rate is higher than many other first world countries. That’s true, just like the claim that Wesson oil doesn’t soak through food is true. The implication, however, that other countries provide better obstetric care is completely false, because infant mortality (death from birth to one year of age) is not a measure of obstetric care; it’s a measure of pediatric care. The correct statistic is perinatal mortality (death from 28 weeks of pregnancy to 28 days of age) and the US has one of the lowest rates in the world, lower than Denmark, the UK and The Netherlands. 2. C-sections are associated with higher levels of maternal mortality. That’s true, just like the claim that Wesson oil doesn’t soak through food is true. The implication, however, that C-sections cause maternal mortality is completely false. Women who undergo C-sections are much more likely to have life threatening pregnancy complications or serious pre-existing health problems and C-sections usually are undertaken as an effort to save their lives. Look at any natural childbirth advocacy website or book. Lots of empirical claims are made, but there is no attempt at scientific integrity. Where are the facts that put those empirical claims into perspective? You won’t find any. Where are the alternative explanations? You won’t find any. Where is the rest of the information, the information that obstetricians have and that leads them to make different recommendations? Nowhere to be found. Not only is there no attempt to provide “all of the information … not just the information that leads to judgment in one particular direction or another,” to the extent any effort is made, it is effort to obscure and mislead. Natural childbirth advocacy websites and books are advertisements, in the exact same way that the Wesson Oil commercial is an advertisement. The creators decide in advance what the conclusions must be and selectively supply information that appears to support those conclusions. That’s why the idea of becoming “educated” about childbirth by reading natural childbirth websites and books is ludicrous. It makes as much sense as claiming to be “educated” about the physico-chemical properties of cooking oil by watching a Wesson commercial.